Olympus USA has produced a spoof documentary that claims to highlight the problems faced by those who spend too long carrying heavy DSLR equipment. The hero of the films, Paul, suffers a condition called 'DSL-Arm,' which is characterized by a dramatic lengthening of the right arm. According to the narrator the lengthening is the natural conclusion to a life carrying weighty camera bodies and lenses. Of course, the company doesn't just highlight the issues and the cause, but also offers the cure. Presumably after some consultation with the Olympus medical division, the campaign suggests photographers switch to smaller, lighter cameras that don’t bring on this condition. 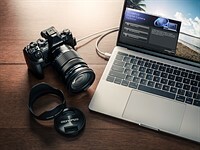 The website conveniently features a section in which DSLR owners are invited to list their symptoms for automatic diagnosis – though it seems the prescription is always the same: an Olympus OM-D E-M5 ll. The company played a similar card during the UK's The Photography Show consumer exhibition: offering massages to DSLR owners under the banner 'DSLR Users in Need' – a take-off of the popular UK charity appeal Children in Need. You can see more of the films and a behind-the-scenes video on the DSL-Arm page of the Olympus website. OMD IX will you post this when that comes? There is marketing and funny marketing. I enjoy the latter. The EM5 with 12-40 PRO comes in at just under 900g. It's lighter than a DSLR but not by much and given its small size it feels heavy. Swap for the 17 f/1.8 and it's now a lot lighter, so I think for general shooting this would be the kind of lens to use. The more plastic primes would be lighter still. I've not weighed it with the 45 f/1.8 on. That lens is certainly pocketable. My old F601 film camera without battery comes in at 1kg. I was surprised it was that close as it feels like a brick in comparison with modern kit. Nikon claim 1.1kg for kit such as the D90. It's a little funny and lame too. But it's message is for the "All In" or "All out crowd." You meet them... Examples the say: "This is a once and a life time." Plenty Often. Is Olympus fixed "shutter shock" for EM5/P5? EM5 and P5 M43 cameras even NOT have a mirror, but "shutter shock". I still have an ancient OM-10 film SLR in my loft. It must be about the same size (or larger) than the OM-D E-M5, but even so the body was always impossible to hold on its own. I always had to keep the bottom half of the 'ever-ready' leatherette case attached just to give it some shape, and even then my right hand would get cramp after a while. Sorry Olympus, these silly marketing games can't hide the fact your products are underspecified and too expensive. I have two words for you, just two words: Pentax Q.
I don&t think the arm is due to DSLR, its just rapid evolution to adjust to his tool size. He must have a big tool and he needs big arm to rub it around. If he had small micro 3/4 sized tool he would still have small arms. Just pure biology me think nothing to do anything digital. This campaign was not, seemingly, the idea of experienced SLR photographers, but uninformed marketing types, as it is the left arm that normally supports the weight of the SLR camera and lens, from below. There are, of course, times a shooter needs to shoot with one hand on the camera, while the other hand does something else, but vertical support, from directly below, is a best practice for steadying the camera for the shot. The guy with the long arm didn't get that way from using a DSLR, he's a proctologist. Oh, now I see where Olympus are coming from... now let me see; what camera would a proctologist need? Small and light would be a definite plus... smaller lenses... Internal focus... control via remote app... yep the Oly is the perfect camera for a proctologist. I suppose I'm a young and strong guy. Because I never get any sort of pain from carrying around my DSLR. I would love to have an OMD ONLY because of the rapid focus and EVF. Not because of the size. If your camera is too heavy, go work out or something. Seriously. I didn't bother watching the video, but that guy in the preview holding his camera like an idiot. No wonder. If that's how people shoot their cameras. I don;t think being young or strong has anything to do with wanting smaller gear. When I had my E-M5 I no longer carried a camera bag during the summer. I was able to keep one lens on the body and 2 in the pockets of my cargo shorts. Granted they were not the PRO lenses they have today, but I was still able to carry multiple lenses in my pockets. I don't ever see myself going back to a full size DSLR. The problem is, in fact, real. Olympus has has its problems. It has also long produced smaller, lighter camera kit much needed by many. You're forgetting about equivalence. Because the sensor is only one quarter of the size of a 'full frame' sensor, you have to apply a 2x multiplier to arrive at the effective weight. In other words, although actual measurement may indicate that m43 systems only weigh half as much as full-frame systems, in reality they are effectively twice as heavy. Those m43 pancake zooms, so much bigger than the paper-thin 24-84 f7-11 zooms in FF. "Italian Daniele Colli (Nippo-Vini Fantini) suffered the worst in the crash, as television coverage briefly showed Colli with his arm hyper-extended"
A sad accident. But couldn't that have happened with a Sony A7 and 70-200, too? $9.95 when bought with any Olympus camera. I think this ad campaign is stupid and offensive. I disagree! This advertising video is stupid and boring. It's too lame to even qualify as offensive. Its offensive to people who always have a DSLR on their arm, haha. J/k. You have to see the humor in this. People have been bringing chunky giant cameras to events for decades and decades. With cellphones most people are realizing "Forget the stupid cameras, the one on my phone is good enough". And others are realizing, "Well, mirrorless is good enough with the SAME quality I was getting from a DSLR just a few years ago." So, its funny. A lot of people just dont need a DSLR. Its not stigmatizing professionals who need a DSLR for lowlight or shallow depth of field or what not. Its just a joke, given the trend for things to be smaller, whereas many DSLRs have actually been getting bigger (Nikon's lenses for example). Offensive in what way? It is silly and dumb... like a vast majority of TV shows nowadays and it does one thing obviously: it gets attention (it got yours). Sometimes even negative attention is better than no attention, and I doubt anyone will reject the EM5II because of it (well... other that ThatCamFan who stated to the contrary perhaps ). If anything it may prompt some people to look it up to find out what it's all about that would have never even thought that Olympus was still making cameras! There's Nikon and Canon and nothing else no? It's offensive because it implies that anyone who uses a 'heavy' camera is a deformed idiot. You seriously cant be that sensitive. Can you? Just read nerd2's classic comment abour how since f2.8 on m43 is really f5.6, and so apsc with an f5.6 lens is better. I bet he still doesn't get why that is so funny. f2.8 lens on m43 has the same pupil diameter as f5.6 lens on FF, and accepting the same amount of total light (hard fact) And this makes the resulting images ROUGHLY similar in terms of DOF and overall noise level (rule of thumb). ecm: unfortunately it was you who embarrassed yourself here. How do you account for the fact that you have a four times larger sensor on FF? Don't you think setting f2.8 on both system doesn't show a difference, when you get the same light intensity/unit square, but gather it for a four times larger area? m43 has their merits, but also their disadvantages. ffs Aperture is a LENS property. Has NOTHING to do with sensor size. f2.8 gathers as much light on MFT as it does on FF. The difference is DOF changes when we talk equivalent field of view, because smaller sensors sees less. So to have the same FOV you need to step back, hence changing distance to subject. If you want really smooth bokeh on MFT consider the Voigtländer f/0.95. @cliffnj: As I said, with light gathering you mean intensity per area. The total light captured is obtained by multiplying with the sensor area, i.e. four times more with FF. So in addition to DOF, S/N ratio is another quantity being affected. All this equivalence talk is IRRELEVANT if the shots you're taking aren't limited by noise and you don't need shallower depth of field. I come from film days, and IMHO today's sensors are so capable that I simply don't require any better noise performance that what my M43 camera provides. And if I think I'm going to need shallow DOF I can bring along my f/0.95 Voightlander. So why on earth would I want to lug around a larger camera and a collection of larger lenses for it? Since when f0.95 voitghtlander has become smaller and lighter than FF 50mm 1.8 lenses? Fine for you. If I did casual work I would probably do the same. If you need to have high ISO performance (weddings) things are still different. I would not use m43 at ISO 6400 and up. I had Voigtländer lenses, but found them soft wide open. I am usually for AF instead of manual focus if possible, too (cumbersome with shallow DOF and constantly moving subjects, and I don't do movies). @cliffnj: That Voigtlander 17.5mm f/0.95 looks sweet but at nearly $1K it will have to wait a while. I have no problem with what nerd2 says, as its correct. The issue is the assumption that sensors of varying size are equally efficient, but they generally aren't. Small tend to outperform larger ones per unit of sensor area., and progress in smaller sensors seems to be leading larger sensors these days due to demand, which would tip the efficiency scales in favor of small sensors. Its really a discrepancy between theory and practical results. Yes, but how large is those difference in efficiency (and what do you exactly mean by this)? It is certainly not enough to make up for the four times smaller area. Other models, like the A7s even differ more dramatically, giving 2.5-3 stops advantage at higher ISO, more than expected. What it's trying to say is, use iPhone instead. Olympus, I had the e-m5 mark 1, 12mm 2.0, 45mm 1.8, panny/leica 25 1.4. I also own a DSLR. This ad to me sounds more like you are bitter towards people who do not buy your products. Perhaps if your company wasnt so massively corrupt and dealing with giant PR problems I would of gotten the mark 2 but this ad convinced me not to buy it. When you are bitter and spiteful towards the world it becomes really unattractive. I just removed the mk 2 from the "i want this" list. @nerd2... what color is the sky in your world? Nerd2 forgot to mention that he lives on the moon and his D810 barely weighs anything! Since when is a D810 equivalent to a EM-1 (other than it is the top model)? So which DSLR to compare? FF with 4-times larger sensor? APSC? Probably. D5500 is similarly heavy, for example. Which lens to choose? The 24-70/2.8 is not equivalent to the 12-40 either (only w.r.t. AOV). 17-50/2.8 on APSC? 180g heavier, but larger DOF control. There are no directly comparable lenses and cameras. But using an APSC-model with DX-zoom and you just have a little more weight, but more MP and larger sensor. Of course you have other advantages with an EM1, but the difference is not as huge. 12 -40 2.8 is equivalent to 24-80 5.6 for FF, and both nikon and canon has lightweight apsc dslrs which are hardly hea ier than em1. And if you ignore the equivalence logic and DOF control, sony RX100 series have good enough IQ, higher resolution and faster optics in truly pocketable package. Oh now smartphones are surprisingly good in most occasions, and have f1.8-1.9 optics with OIS too. @nerd2: Rico gr are nice cameras, too, with excellent quality. Agree with the Rx100. For many uses I would even prefer the Nikon 1, even lighter than m43 with huge reach. Could even attach larger Nikon lenses via adapter. @nerd2 - Thanks for pointing that out! I'll bet no one who shoots m43 has ever heard of this equivalence thing before. Wonder why no one else ever brings that up? @Nerd - If you're going to compare a budget DSLR then you need to pick a budget m43. You cherry pickers always pick the largest m43 and then compare to a budget DSLR and say they're almost the same weight as if there are no smaller m43 bodies available. Try finding a DSLR the size of a Panasonic GM5. @string - yes, we do know of equivalence. It's been beaten to death over and over by over and over and over and over and over by folks like you. Yet we hardly hear of it in APS-C forums. I wonder why? You guys are so predictable. When cornered, bring up the equivalence argument! Ignoring equivalence when comparing different format is very misleading, as you can always have smaller sensor that will make the system lighter and smaller - all the way down to phone cameras. And yes there is lightweight m43 cameras and heavy m43 cameras. And oly marketing team somehow ridiculed "heavy cameras", which includes their own professional cameras and lenses! @Cipher Take a D5500 and Em5ii. 400 Euros cheaper, and same weight. The Gm5 is of course extremely small, but, for me, not nice to handle. Is this a typical m43 camera in terms of size and weight, by the way? Equivalence is important. How else are you able to compare sensor an lens performance as objectively as possible? Good luck shooting your f5.6 at f2.8. Would be great if you provided us with these images. One hand, the other hand. Do they know each other? Hilarious. I can't believe all the people in here taking that seriously. That's as funny as Chubbs from Happy Gilmore. Much better idea than getting the "Will It Blend" folks to demonstrate that an OMD E-M10 with 17mm lens will blend but a DSLR from Nikon or Canon will not fit in the blender. See http://willitblend.com/ or countless youTube videos. I have small fingers. Forget DSLR Arm - I don't even want DSLR Hand! Unfunny, tired and stupid. If you don't like carrying heavy things, try not buying them. I think that was the point, and good to see that you got it. n3eg, that was not the point of the video at all. 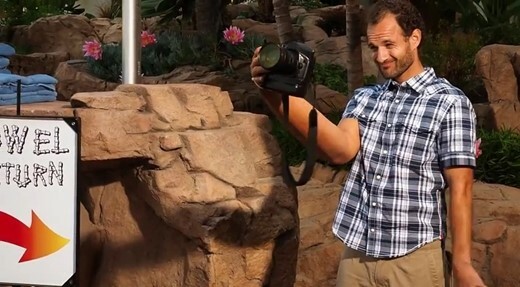 In fact, it tried to portray anyone who uses a DSLR as a deformed, goofball nerd. The point Wubslin is trying to make is that you should buy the camera that suits you best. And Wubslin is right. darngooddesign: Don't presume to speak for me. I don't have to presume, I just read what you posted. Unfunny, tired and stupid. I believe that's what I wrote as my opinion of ths idiotic advertisement. "If you don't like carrying heavy things, try not buying them." Which is the point of the ad. It's not going to convince me to purchase a Micro Four Thirds camera, but it was creative and funny! So here’s the ridiculous thing. Buying a camera because it’s small and light is like buying a car because it has a radio antenna. Yes, I enjoy listening to the radio, but that’s not why I buy a car. The reason you buy a camera is to take photos. I’ve never looked at a print and thought, gee, that must have been taken with a small and light camera. So you shoot everything with an 8x10 camera then. Don't leave home without your Polaroid 20x24 Camera--instant gratification. 8x10 cameras just can't offer the same depth of field. Buying a camera because it’s small and light is like buying a car because it’s small and light. It is because it goes with you anywhere, especially in places where a larger specimen would be too much of a burden. Yes, Close did use one for those for that project. He didn't own it, though. The video would have been funny if the actors had not played it straight but when the most common comment (fully serious ) on DPR is in regards to weight and big heavy lugging around brick cameras there are too many people who already embrace DSL-arm as real (less the stretch perhaps) to be playing it straight. My right arm is bigger than my left, but for different reasons. Not sure why it gets some so bent out of shape though. Do Chevy/Ford owners get upset when xxxxx says they make the best pickup on the planet? Well, maybe the do. Still, its only marketing. Imagine Donald Trump with a DSLR in each hand. After a while, he'd look like Dr. Zaius. LOL, yeah. I was thinking of an Orangutan. I wonder when DPR will start giving non-DSLR shaped cameras top marks like 87-90%. When are they going to appreciate camera qualities like compactness, portability, being public friendly and unobtrusive, and realise that many users today prioritise these qualities over 10% better AF hit rate, or being able to pull 2 more leaves from the shadows or balance well with large lenses! I have the feeling that for DPR every camera that does not have DSLR form factor is automatically falling in a lower category. One would expect that on a site like this there are many enthusiasts and editors wouldn't be that backwards! DPR have a weighting system that appears slanted more to IQ/ISO than anything else. No-one would argue top SLRs don't give great IQ, but the best camera is the one you have with you. Maybe 60-70% (min) may deem portability/versatillity a top feature, where High ISO may be critical to 20%, yet DPR seem fixated on high IQ/high ISO. We don't all shoot at ISO 10000 and expect to get a perfect 20x16 print. 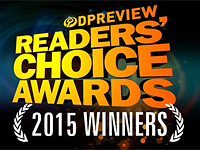 DPR's reviews are okay but their ratings are absurd and lack relevance. @J.H. So a smart phone is the best camera then. The scores are _within_ the same class of cameras. I think a weighting system slanted towards IQ/ISO within each class is a reasonable thing. Isn't good IQ the reason to buy a camera instead of a smartphone? @E. Everyone has different priorities. Your opinion is just that, an opinion, as is mine and therefore not universal. Smartphones fulfil most of your points, which is why camera makers (incl. 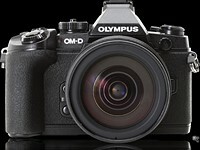 Olympus) have problems selling cameras. The rest is conspiracy theory. I just watched the video: The thing which makes me wonder is, why on earth is Oly (using GH4?) not able to accurately focus? Doesn't help advocating m43 (I still have a Panasonic m43 camera by the way, which I hardly use, and shot the EM1 extensively, so I know the system in case people think me too biased). Actually if you consider Flickr statistics, which is probably the largest photo sharing community, Apple is the most popular camera brand, followed by Canon and Nikon, followed by Samsung. With regard to the reviews DPR have their categories, but they never seem to give credit to a certain camera for being more compact from the competition. For example the RX100 III, falls in "Enthusiast Large Sensor Compact Camera" category which sounds fair so far. But then when the criteria are listed below compactness, weight or even something like true pocketability is not included anywhere in the list, although these should be major features in this category. The closest thing is "Ergonomics & handling" but then the RX100III is marked significantly lower than Pana LX100 although the latter is considerably larger. This makes me think that even in this Compact Camera category DPR are using their DSLR mindset - chunkier and heavier is better! Before I was getting annoyed by their reviews thinking they are biased towards one brand or another, but lately I understood that they simply don't appreciate compact, unassuming, public friendly cameras. They just don't understand that there are people that want to have a camera with them without looking like a camera nerd or a pervert with a DSLR hanging from their neck or a square heavy bag on the side. I would happily sacrifice a stop in the shadows and the ability to balance 200mm lens for a pocketable camera with a decent sensor, relatively fast lens (f2.8 or even f4 if zoom), several usable controls for aperture, shutter speed, ISO, expo comp or PASM dial. 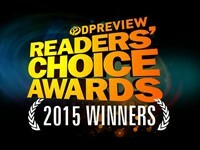 Dpr reviews phone cameras, in case you didnt know. I have the Oly EM5/1 and 6D/7D2. Even though the EM are small it doesn't mean it going to be a comfortable holding it for prolonged period e.g. video. There is thing called monopod which can be more comforting. Sounds very desperate from Olympus. There are also even lighter options called smartphones. I was at the UK Photography Show at Birmingham. The Olympus massage sure did me a power of good. I now have an EM1 and EM10 plus 5 lenses, all fit in a tiny bag and weigh less than 2kgs. Thank you, Olympus - I'm cured!! I don't get people hating on these forums. Who the hell cares what others shoot? so what if they want to carry huge cameras and lenses around or if they want to use their phone or a little p&s, is it really going to somehow make YOUR images better or worse? does it really matter that much that someone else prefers something different to what you like? I for one take as much enjoyment out of making a good image with my phone as I do with my FF with a huge F%&k off lens sticking at the other end. Sadly, a lot of people posting on DPR are some of the most hateful and spiteful bores on the internet. That's why I never read DPR, especially the comments. Desperation is a stinky cologne. I thought it was funny. The subtext that a FF shooter is a knuckle dragging neanderthal made me laugh. That said, if I was a pro and made lots of money I'd have a FF kit in a heartbeat as a backup to my M4/3's gear. I may not be a pro like the FF users on this site, but my M4/3's gear has paid for itself many times over and has produced 2 meter prints hanging in hotels and 3 meter window boxes in fancy stores because people see my work and request me. I walk around with my weather sealed, 12fps RAW burst speed with a buffer large enough to shoot 1200 shots in 20 minutes GH4 and 35-100 f2.8 in my hand with no strap because it's so light it doesn't need one. While some may think it's an inferior toy, as a hobbyist it does what I need it to do. It is an absurdist ad which, whether or not you believe it to be effective marketing, has apparently exposed a tender underbelly in some commenters. I know it is the same old song, but there are wide creative potentials in most any photo format. If you desire the technical latitude in FF, or APS-C - think it the best fit for you - go for it. [I spent most of my time early in photography with medium format film, and loved it] Later, as a teacher of digital photography, what really came to bother me was when a predictable number of students each term would directly state or imply that serious work could only be done on full frame gear or the like. Of course, there is something to be said for the idea of 'the proper tool for the job', but there is also a lot to say for duct-tape and creative ingenuity. Too often, I watched students invest in expensive gear only to be frustrated that the road to good work was just as long as before they had it. Again, old song (sorry), but one that anyone new too photography should hear, and at least consider. Rather than policing the boundaries of formats - proclaiming exclusive domain of quality here or there - endeavor to develop your ideas and processes wherever it is you find yourself standing. And does this mean that (observing natural difference) someone might produce excellent work with say a mobile phone? You bet your *ss it does. A good question to ask is why do some of us in the photography community find such a notion so appalling. This just in ... Olympus to follow in the footsteps of Geico (remember the Cavemen commercials ?) They're going to premiere a new sitcom starring a bunch of guys with DSL-Arm ... How can it lose ? I thought the commercial was pretty amusing. Some of the reactions here are even more amusing ! How can this be a DSLR user? Holding one hand, using the rear viewfinder for shot. How to get an sharp image without shake. Even when I use smart phone for shoot, I hold with both hand and not to extend the arm. Because men tend to have more strength in one arm...no need to explain why. You're right, this is clearly intended to be a serious quasi-documentary and the failure to clarify that DSLR users hold the camera with two hands and use a viewfinder is an unacceptable flaw. I forgot that Rambo firing the GPMG with only one hand. I thought that was due to extending arm to take selfies! This is a terribly lame effort from Olympus. I own OMD-EM1 and EM-5 and a few of the Olympus pro lenses. But there is no way, It would ever replace my Nikon FX DSLRs. I think in the mirror-less world, Fujifilm and Sony has a better future ahead than m4/3. So, making crap videos with fake long arm will bring no good. I disagree, I think its good video. All this video saying is that Olympus mirror less is lighter and smaller. No need to panic, no one taking your DSL-Arm from you. You need to improve your humour:gear ratio. Man, you sure need to lighten up! Nobody is asking you to ditch your Nikon - though in half a dozen years you may not be able to BUY a camera with a mirror box. You own EM1 already so you have avoided the worst of DLR-Arm - phew! well, I carry arround a pentax 67 most of the time for my type of work. So far both of arms are in perfect shape if you are wondering! I bought olympus OMDS to see for myself the IQ. I have to say, IQ from olympus OMD EM-1 and EM-5 are quite good for a small sensor. But when you I compared with my D610, the Olympus is way far behind in terms of IQ. Now, some might say, the Olympus is also much smaller than the Nikon. My answer to them is, I am not willing to compromise with the IQ for the a few hundred grams of weight. And I am not a fanboy of any particular brand, as I own different cameras from almost all of them. I have no problem to buy a camera without a mirrorbox as long as it can maintain with IQ. That is why I think, Sony and Fujufilm is going to the right direction. On the other hand I do not think m4/3 will never replace the FX sensors. It will always be the mediocre camera, no matter how rude that sounds to Olympus or panasonic Fanboys. PS: I do not see any good reason to buy a EM-1(497 grams) when you can buy a Sony A7(474 grams), which by the way has a better sensor and better IQ, better Video functionality and costs 300 USD less!! I just wanted to try them out, that's all. They really need to push mirrorless cameras as something a hipster would use.